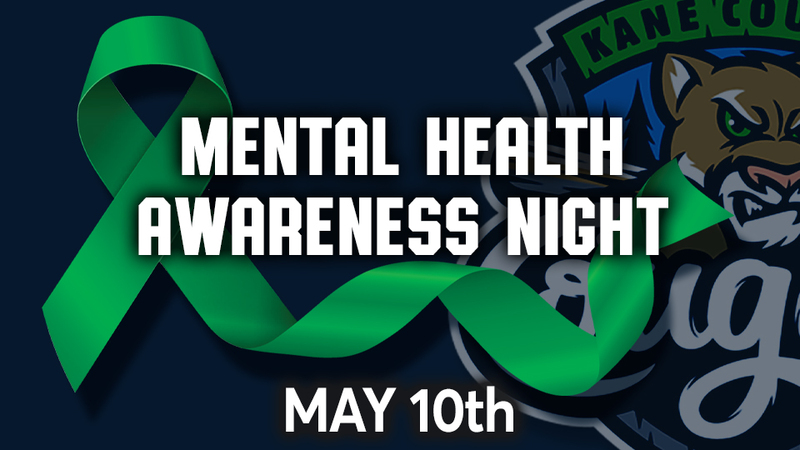 GENEVA, Ill. - The Kane County Cougars have teamed up with local organizations to host their inaugural Mental Health Awareness Night on Friday, May 10. First pitch is at 6:30 PM against the Lansing Lugnuts. For tickets, visit www.kccougars.com. In an effort to strikeout the mental health stigma, the Kane County Cougars Baseball Foundation, Inc. will make a $100 donation for each strikeout recorded by a Cougars pitcher during the game. All funds will be divided among TriCity Family Services along with National Alliance on Mental Illness (NAMI) of DuPage and Kane County. May is Mental Health Awareness Month and the awareness color is lime green. The team will take the field in their lime green jerseys while Cougars staff members will wear lime green ribbons. Throughout the night, videos and public service announcements from Seize the Awkward as well as TriCity Family Services and NAMI will be played. TriCity Family Services, NAMI DuPage and Kane County will also be in attendance with information and resources available to those in need. In addition, the Cougars are hosting a Mental Health Awareness contest. Fans are encouraged to create a poster promoting awareness for mental health issues. The Cougars will select 10 winners to receive complimentary tickets for the game on May 10. Poster submissions can be emailed to art@kanecountycougars.com. The winning posters will also be displayed throughout the ballpark. Following the game, fans will be treated to the first post-game fireworks show of the season set to modern pop music. Fans are also invited to run the bases after the fireworks. For updates on the Cougars 2019 season, follow us on Facebook, Twitter and Instagram. The Cougars, Class-A Minor League affiliate of the Arizona Diamondbacks, have been at the forefront of family-friendly entertainment since 1991. In 2015, the franchise became the first Class-A team in Minor League Baseball history to welcome 11 million fans through the gates. A total of 173 former Cougars have reached the Major Leagues including Miguel Cabrera, Nelson Cruz, Josh Beckett, Adrian Gonzalez and Kyle Schwarber.